Keep your important maps, signs, data, field notes and other documents safe by using a paper that is water resistant, tear resistant and very durable. Ideally suited for use anytime printed materials will be subject to frequent handling or extreme environmental conditions. Apart from the superior durability and tear proof qualities of this category of papers, it is also a cost effective way to print. In many applications it removes the need to laminate paper in order to protect it. Stronger than paper and more versatile than synthetic films, Tyvek delivers unparalleled strength in an ultra-lightweight print material. From banners that won’t fade or rip no matter what the weather, to ski tags that will survive the most challenging downhill runs all day long, to labels for everything from construction to horticulture to shellfish, if it has to last it should be printed with Tyvek. Strong, lightweight and durable, more versatile than most synthetic papers. Tyvek repels water and resists tearing. The characteristics of Tyvek make it an ideal choice for envelopes, particular larger envelopes that are used to transport heavy or bulky contents. These include catalogue envelopes (open end) and booklet envelopes (open side). Synaps is the next generation of synthetic paper made from high-grade polyester. Polyester films have superior dimensional stability, unmatched lay-flat characteristics, and the look and feel of premium paper. The result: great looking printed applications that hold their shape and colour without extra laminating, mounting or coatings. Synaps is waterproof and resistant to grease, chemicals and other liquids, characteristics that make the product suitable for both indoor and outdoor applications. Waterproof, tear-proof and weather resistant to hold up in the toughest indoor and outdoor conditions. High rigidity and flatness, suitable for a wide range of applications like point-of-purchase displays, durable signage, menus, maps and manuals. PaperTyger is a heavyweight tear resistant laminated paper manufactured to produce an alternative to synthetic paper and other durable media products. The lamination process combines an oxo-biodegradable film and FSC® certified papers. 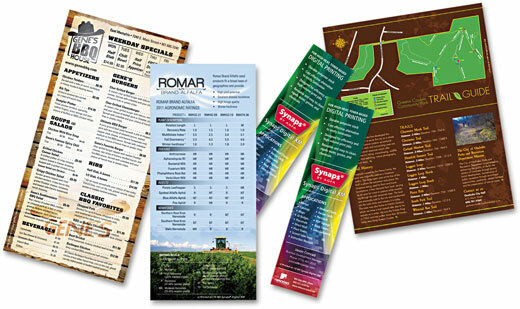 While remaining environmentally friendly, PaperTyger® offers comparable durability with significant advantages in terms of printing and converting. Versatile—these durable papers are easily embossed, die-cut, perfed or glued, and have superior fold endurance. Manufactured acid free with neutral pH characteristics, these papers offer archival permanence in addition to the already enhanced durability. The Rite in the Rain story began nearly a century ago in the forests of the Great Northwest. Entrepreneur, Jerry Darling, recognized the logging industry’s need for a durable material that could be written on and survive in poor weather conditions. Environmentally responsible coating process. Rite in the Rain is a wood-based & recyclable paper. Unlike plain paper, it won’t turn to mush when exposed to: rain storms, heavy sweat, oil and grease, mud and grim, laundry mishap. Writable underwater. The paper can get completely saturated and remains intact and writable – perfect for marine biology, ecology, and oceanography applications. Always test before printing important projects! These paper products are intended for short-term outdoor use. With prolonged exposure to water the papers can become soft, difficult to write on and lose their strength. If you need long-term exposure to water a metal sign or a rigid plastic card is more appropriate. If you are going to use a waterproof paper for an important application we strongly recommend testing the anticipated environmental, handling and storage conditions to be sure that it meets your needs. For more information about waterproof and durable printing papers, contact one of our knowledgeable sales representatives.